Are You Too Comfortable With Strain? 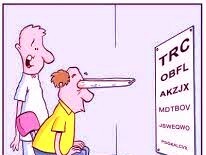 The eye doctor in this cartoon realizes his patient is straining, and tells him so. 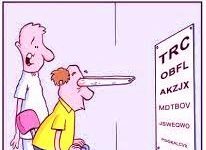 “That’s the worst case of eyestrain I’ve ever seen” reads the caption elsewhere. 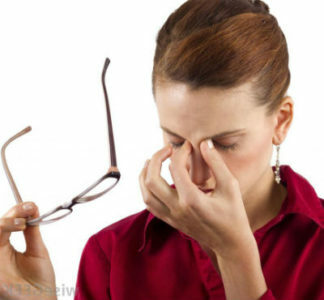 Many of us are not aware when we’re straining our eyes, even if it’s most of the time! It’s such a familiar habit and feeling, just the way things are. 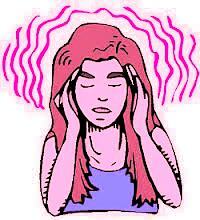 Only yesterday an anxious client exclaimed, “My eyes are so tense, they don’t know what it’s like to feel relaxed!”. Years ago my first vision teacher said “Myopes can tolerate a high degree of discomfort”. Being extremely nearsighted for much of my life, at first I took this as a compliment — I was not a wuss! Then I thought about it more, and it dawned on me that I wasn’t doing myself any favors. Why put up with pain and struggle, especially if I could learn to let it go and to see in a more relaxed way? As I continue to improve my own eyesight, I’m finding I’m sensitive to more subtle signs of strain in my visual system. This is good — if I don’t know I’m straining, I won’t put any focus on stopping that. Years ago a headache would have to be screaming at me before I’d give it attention. Now when I feel even a slight ache in my brow or temples, I stop what I’m doing (often I’m at the computer) to give myself a break, maybe do some palming or go for a walk. If you’re neglecting taking care of your eyes, my guess is you’re letting your self-care slide in general, and your vision care is just a subset of that behavior. I’ve written about this before, here. You wouldn’t neglect your pet, or your child — don’t you yourself deserve the same attention, maybe more than anyone? You don’t have to take a tropical vacation and ignore all your responsibilities to find time to relax and take care of your eyes. The client I mentioned earlier, a very busy woman, wasn’t doing any palming. The single time she did she loved it, but she thought she had to palm for 20 minutes or a half-hour for it to be effective at all! A little bit is better than nothing. Just a few minutes of palming can be surprisingly soothing to your jangled over-stimulated visual system. Give yourself a treat and try it. For years I’ve noticed people taking off their glasses to talk to someone else. It never made sense to me — didn’t they want to see the other person clearly? Sometimes they looked like they were getting a headache, like the lady in the picture. From wearing thick heavy glass spectacles as a child, I have a negative association with them. I would much rather deal with a little blur than subject my eyes to that restrictive cage, which feels like the opposite of freedom, like wearing clothes that are too tight. Please allow your hard-working vision some down time, or a colorful 3D landscape to look at instead of a computer screen. And then notice how your brow and shoulders and neck and breathing relax. You were more tense than you knew. Vision improvement is about 1) Awareness and 2) Healthy habits. Stay aware, stay relaxed, and most of all have fun seeing! Previous Previous post: Could A Past Life Affect My Vision Now? Next Next post: Are You Stuck Looking At A Particular Distance?